This study compared acute responses of systolic and diastolic blood pressure (SBP/DBP), cardiac output (Q), heart rate (HR), stroke volume (SV), total peripheral resistance (TPR) and rate of perceived exertion (RPE) during resistance exercise performed continuously and discontinuously. Hemodynamic responses and RPE were assessed in the last of 4 sets of 12 repetitions of the knee extension with load corresponding to 70% of 12 repetition maximum, performed continuously (C) or discontinuously, with pauses of 5 s (D5) or 10 s (D10) interspersed in the middle of sets. The increase in SBP was higher for D10 (34.0±8.4%) and D5 (34.1±13.2%) vs. C (19.8±10.3%; P<0.001), while no difference was detected for DBP. Q (P=0.03) and SV (P=0.02) were higher, but HR was lower (P=0.04) in discontinuous vs. continuous. TPR remained stable during continuous, but significant decreases occurred during the pauses in the discontinuous protocols (P<0.001). The BP was higher in discontinuous than in continuous protocols, but the RPE was attenuated in discontinuous compared to continuous exercise. 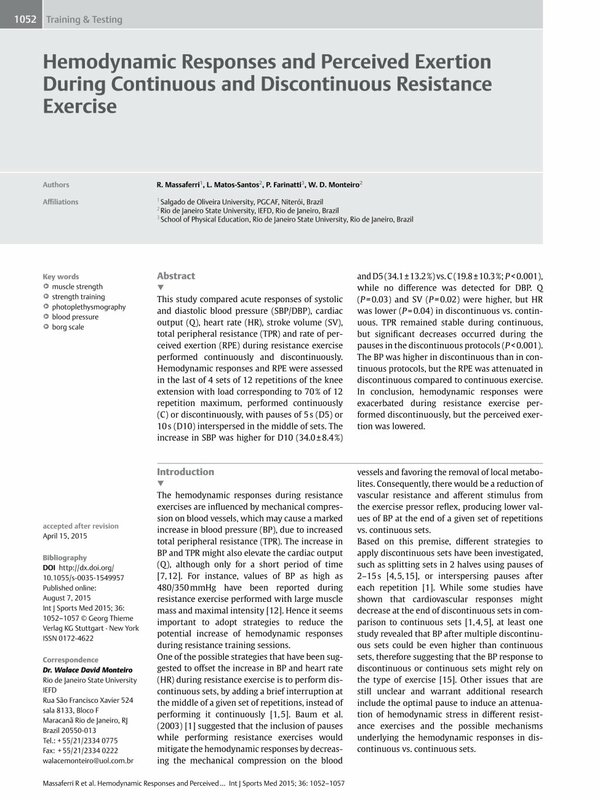 In conclusion, hemodynamic responses were exacerbated during resistance exercise performed discontinuously, but the perceived exertion was lowered.